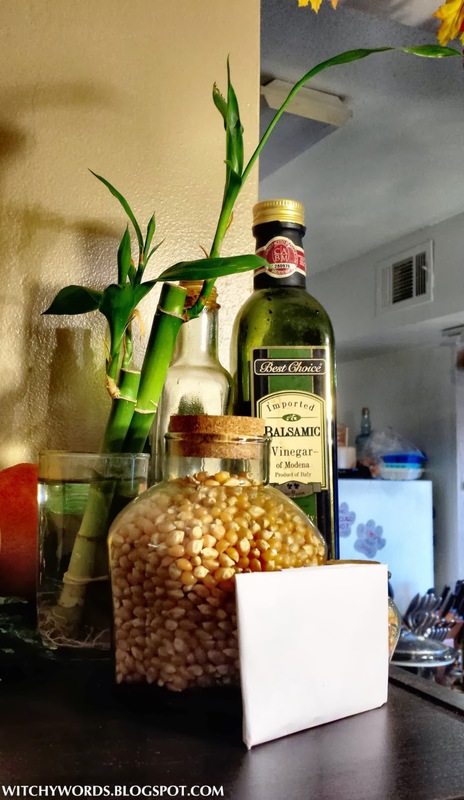 Below, you'll find details and pictures of my kitchen altar! 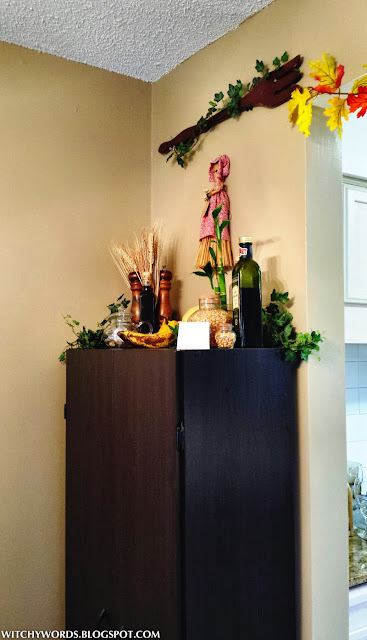 This altar was placed as soon as I bought my new pantry shortly after moving into our apartment. I was looking at it today and realized I hadn't shared it with everyone! 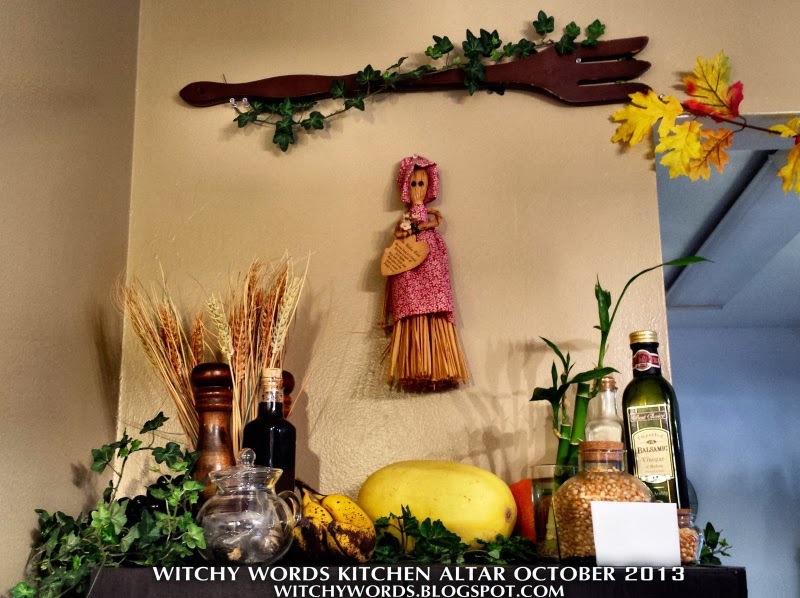 My altar is not placed in the kitchen, but rather in the corner of the dining room in front of the kitchen entrance. This serves two purposes. First, being on top of the pantry, it helps to ensure that our pantry always remains full and bountiful. Second, being at the entrance of the kitchen helps to imbue the energy exerted by the items placed upon the altar to those who enter the kitchen. Wheat symbolizing baking and harvest. Tea, welcoming visitors and friends. Salt and pepper for protection. Fruit for the productivity ("fruitfulness") of the kitchen. I've also placed bottles of local honey on the altar to tie it into the area we live and hopefully ensure the fertility of the local land. A living plant for life, fertility and happiness (specifically Lucky Bamboo, primarily because it survives with less light, but it also represents luck and fertility). Corn for wealth and abundance. 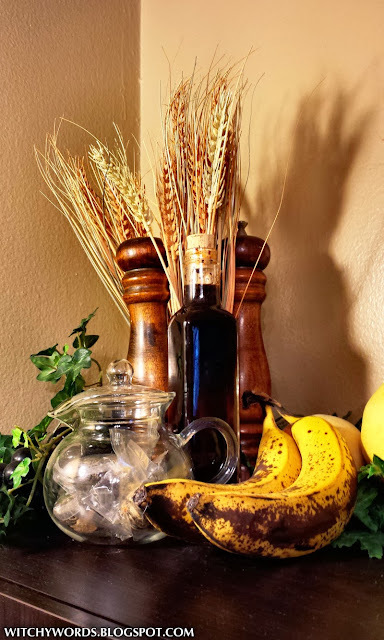 Balsamic vinegar as a symbol of friendship and love. An herb pouch made during the Harvest Moon to help with kitchen witchery. I ran across this doll at a thrift store some time ago and thought it was too perfect to resist. Large wooden utensils are often decorations in older homes. This one, in fact, was owned by my grandmother and passed to me when she passed away. These decorations often symbolized good health. 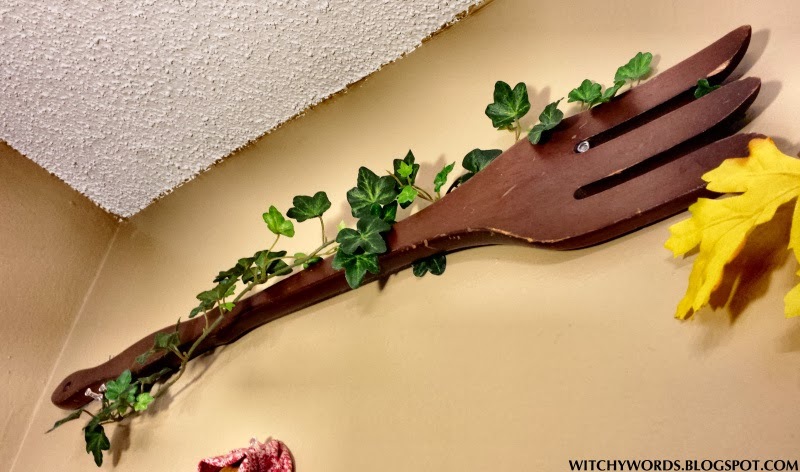 Because the family gathers specifically for dinner, they were also a representation of a strong family - the size of the strength displayed in the size of the utensil. What's on your kitchen altar? Thank you so much for the suggestion! I will definitely do that (as soon as my apartment is a little more tidy) and will post a link here when the entry is posted. Thank you again! Beautiful altar! Gives me some ideas for the kitchen. Right now I just have my Kitchen Witch and a red candle, a broomstick, some paintings, a skeleton key, and a wooden spoon hanging on the wall for Hestia. Thank you so much for your kind comment! Even though it's not cluttered like mine is (and mine certainly feels cluttered), sometimes simple is best. It still sounds like an absolutely amazing altar. My kitchen altar is a three-tier shelf that hangs in my kitchen. I collect milk glass, so I keep a small bud vase with dried flowers in it on the top shelf, along with my mortar and pestle and a small votive candle holder, on the middle shelf I keep a hunk of rose quartz for love and happiness in my home, and some fairy trinkets. The bottom shelf I keep this beautiful wooden log cabin that is an incense burner that we got from my husband's grandmother when she passed away (that's on our ancestor altar for Samhain right now, but it's usual home is on the kitchen altar), and I also keep some salt and pepper shakers that were my great grandmothers on that shelf. I also found this amazing wood plaque shaped like a cutting board that has this kitchen prayer on it with flowers painted on. And the prayer is very vague and fits just about any spirituality. It's awesome. 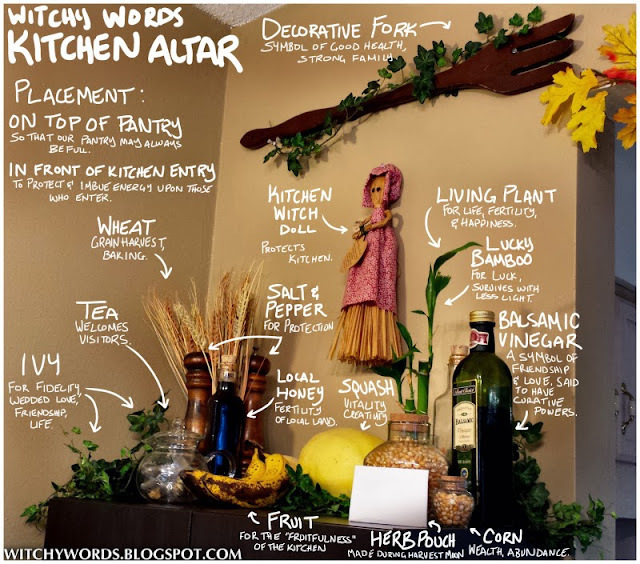 I love yours though, I'm a big ol' Kitchen Witch, so I wish I had more altar space in my kitchen for a big space like this. That sounds amazingly beautiful, Kathleen! I'd love to see pictures of it. Thank you so much for your kind words, as well!